Google's long-standing problem of Android fragmentation — when older versions of operating systems remain on active mobile devices — is getting worse. Over half of all Android devices, or a billion, are more than two years out of date, according to Dan Luu. That's up from 42% of devices over two years out of date in 2014. There are currently eight major versions of Android in circulation, ranging from Gingerbread, released in 2010, to Oreo, released in 2017. As of November 9, 0.3% of Android devices that accessed Google Play during the previous week were running Oreo, 21% were running 2016's Nougat, and 31% were running 2015's Marshmallow. It prevents timely access to new technology. Fragmentation can inhibit mass adoption of new technologies, partly because older OSes don't have the processing power to support new tech. For example, ARCore only works with the Pixel and Samsung's Galaxy S8, which run Android Nougat and above. It introduces security concerns. Platform diversification makes it difficult to properly address and fix security flaws, putting consumers, marketers, and developers at risk. Uptake of new versions of Android is slowing down. For instance, both Lollipop (2014) and Marshmallow (2015) were active on about 24% of Android devices a year from their respective releases. That's compared to the 21% of Android devices running Nougat as of November 2017, one year after its release. Smartphone upgrade cycles are lengthening. This could cause the number of active devices running older versions of Android to remain high. Android's oldest OS version in circulation, Gingerbread, operates on 0.5% of devices, which is nearly double that of the Android devices running Oreo. The severe fragmentation of the Android platform highlights the benefits of Apple's closed ecosystem. Because Apple controls both the hardware and software, it's easier for the company to roll out iOS updates. 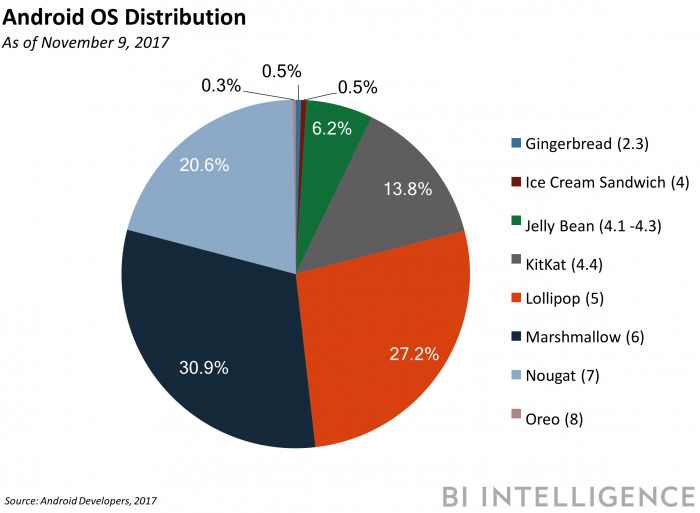 As of November 2017, 90% of Apple devices are running the two most recent versions of iOS. This could give Apple a head start over Android in the AR race, as more Apple consumers will have access to its ARKit than Android consumers to Google's ARCore. Still, Google is taking steps to tackle Android's OS uptake shortcomings. Google unveiled Project Treble with the launch of its Android Oreo, which helps Android device makers and carriers roll out updates of new Android versions faster. However, any benefit is likely years away, since only devices running Android Oreo can take advantage of it and device makers need to meet certain requirements to enable it.